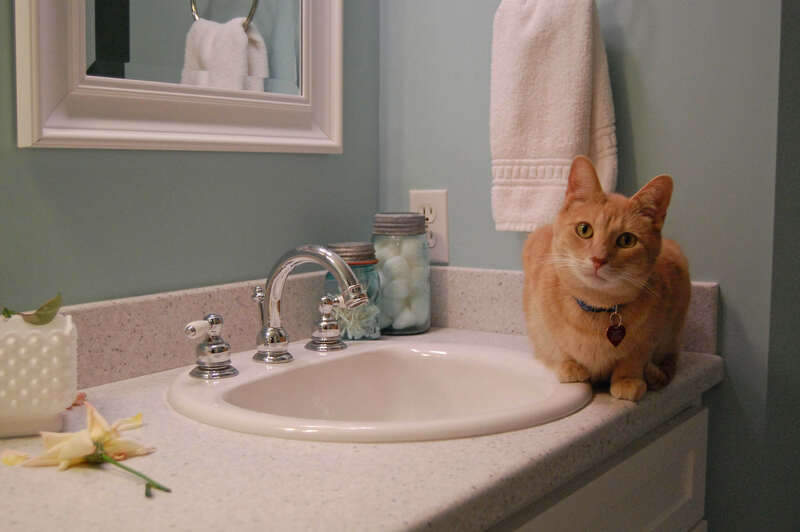 Finally…the bathroom is done! 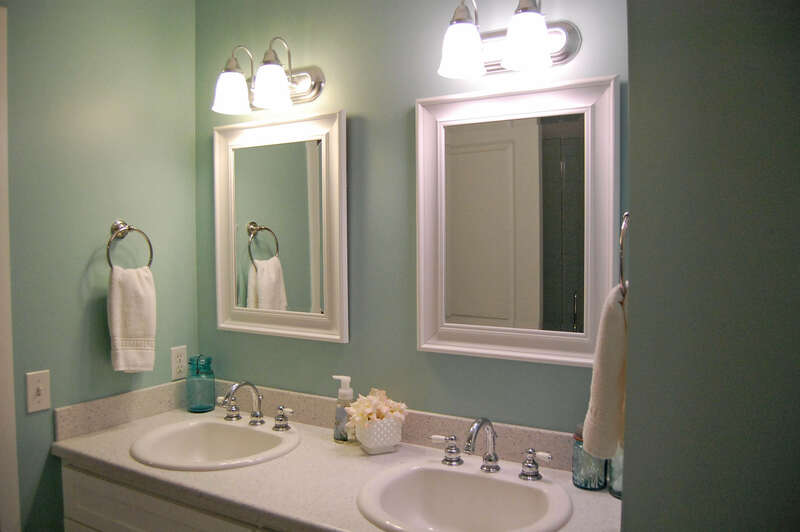 Well, it’s been done for a while now….we just needed to do minor stuff like hang mirrors and pick out a shower head. I’m so excited to finally share it with you. We are so happy with how it turned out! First let’s take a look at what it looked like before we began. I like to call it builder boring. And the shower was awful. The husband had to duck in order to get in or out. And the paint was fading big time. And after. The whole bathroom looks bigger and brighter now (much needed since it doesn’t have a window). We painted the cabinets white and I am so happy with them. My vintage mason jars matched perfectly in here. They now hold q-tips and cotton balls. I love that we each have our own mirror now. However, I didn’t realize that by lowering the mirror a few inches that the husband would be too tall to see his entire face in the mirror. Oops! Luckily he doesn’t mind. 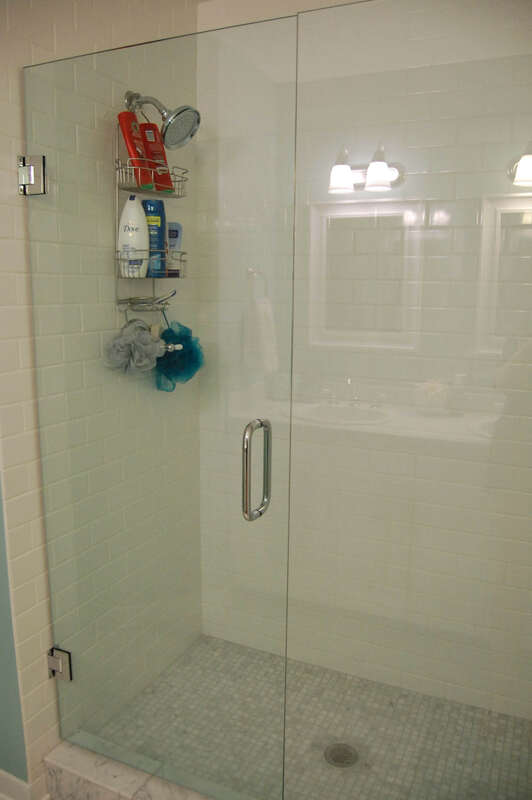 My favorite part of the bathroom is the new shower. We went with white subway tile up to the ceiling and a marble floor. The marble is the same pattern as the floor, just smaller. 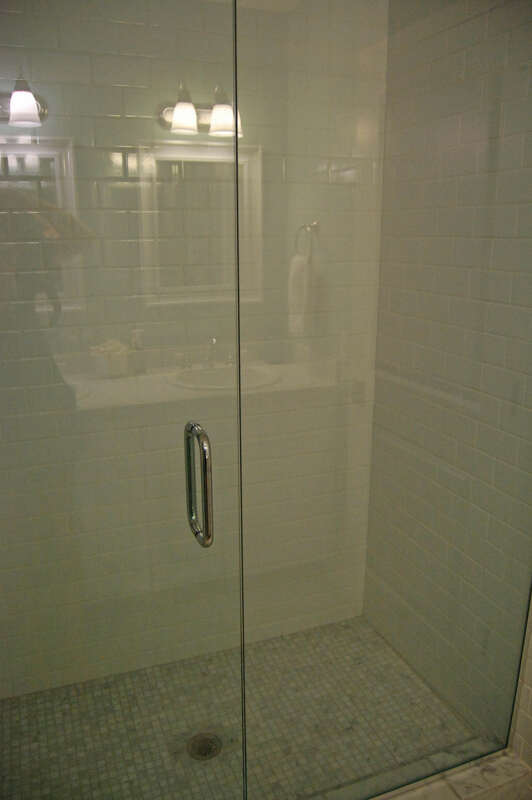 I am also in love with the European glass shower door. Totally worth the splurge. It feels like a spa in there now. Here you can see the floor a little bit. 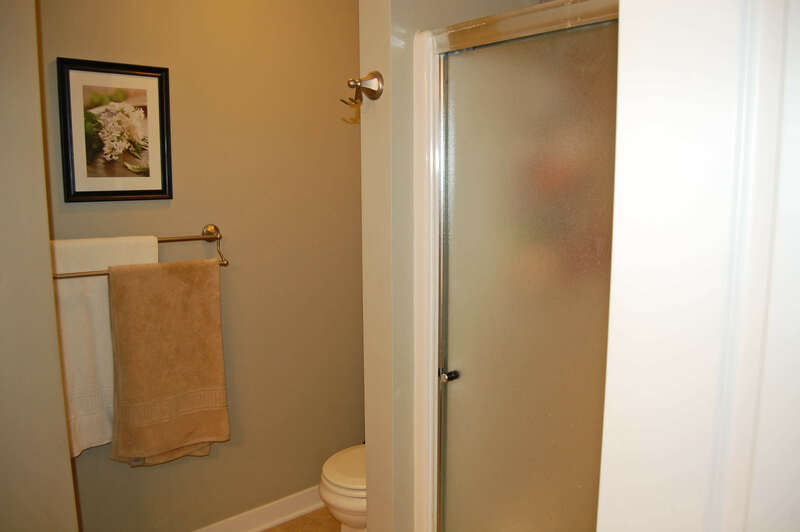 The shower is hiding behind the bathroom door, and the toilet is to the left of the shower. 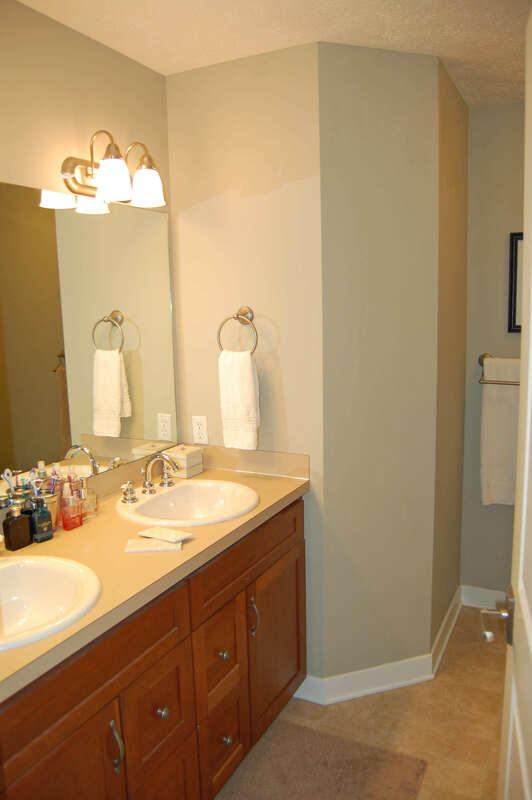 The paint for the walls was Sherwin Williams “Watery”. And do you like my home-made artwork above the towels? It’s just a frame with fabric and wooden letters of “you” and “me”. I plan to add an “&” as soon as I find one that’s the right size. The husband doesn’t get it, so it might not last too long there. Oh well. And just too keep it real, this is what my pretty roses looked liked within minutes of snapping these photos. The culprit…Henry trying not to look guilty. What a transformation! Love the tile and the color of the walls. SO pretty! 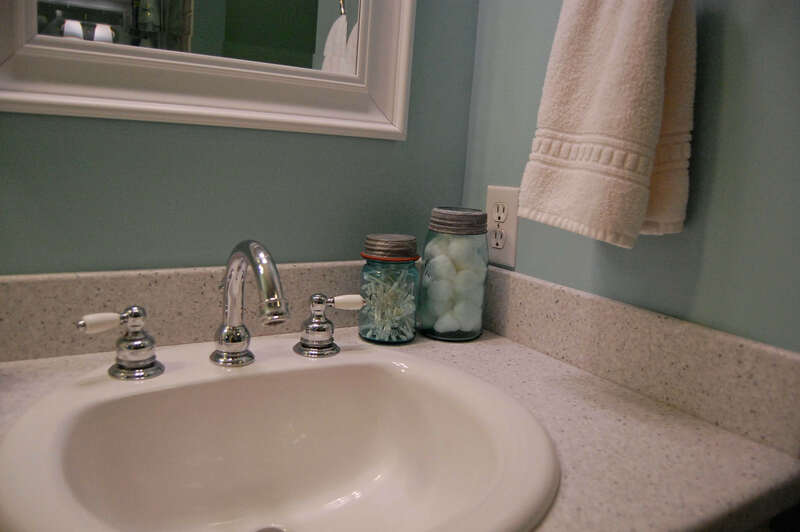 Oo your bathroom is so pretty! I love light, bright colors. I love everything about it! The new wall color is great…makes it look like a spa retreat of some sort 😉 and the shower is fabulous. Builders need to take classes on how not to be so "boring" hahah I think they'd have such happier home owners! I love white! looks terrific! LOVE LOVE LOVE the color!~! OMG. You did an AMAZING job, girl! I LOVE the new bathroom. It looks so peaceful, beautiful, and inviting… especially that fancy shower! LOVE IT! Oh my goodness it looks amazing! Man that color blue with the white trim just pops so well. I love your artwork, too cute! 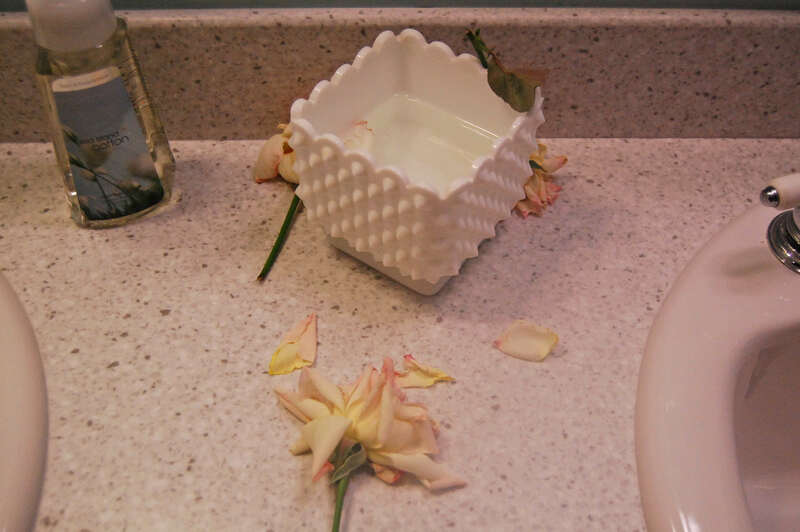 And I feel you about not being able to keep fresh flowers anywhere. Elle eats them and then throws them up somewhere… so gross! Looks awesome, Julie! LOVE the wall color you picked out and the subway tiles! this looks TERRIFIC! love the colors!!! Well done, Julie! Oh my goodness- it is GORGEOUS!!! Can you please come do mine next??? I have to ask- HOW did you get the old mirror off?? What it a total pain? We have one of those in all of our bathrooms, and I HATE them! 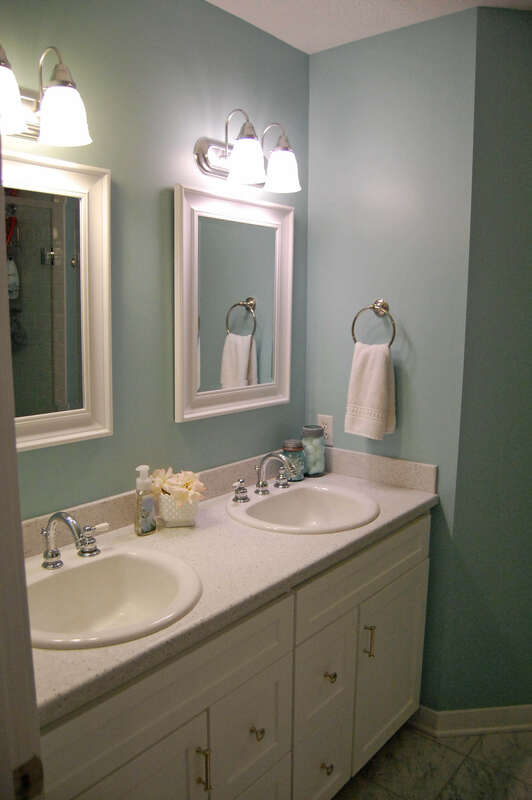 The color is beautiful, the cabinets look fantastic, and the shower is amazing! Love it all! Terrific job! Those lights!! They are on sale at our local Home Hardware and I fell in love with them and decided I needed them in my bathroom as well, so nice to see them in a room! 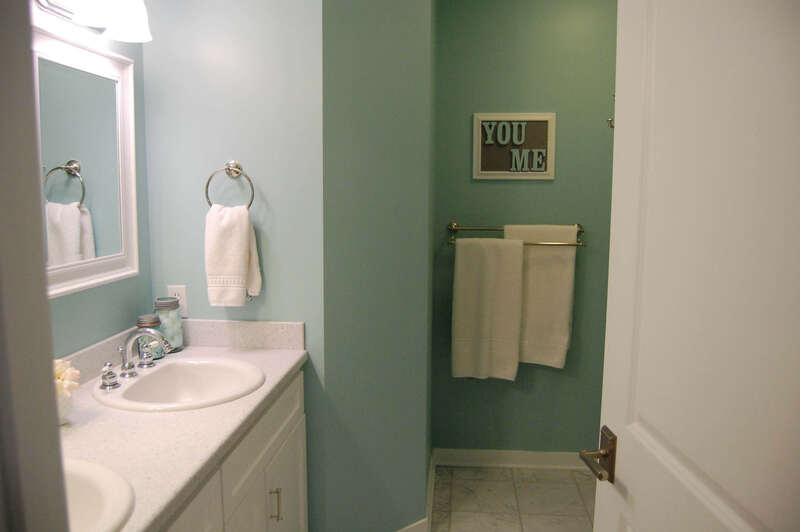 The bathroom looks gorgeous, and I love the wall color! Great job! Enjoy your awesome new bath! It looks great! I love the color in there. So soothing. ok. i LOVE THE NEW BATHROOM. it looks so so so much better. i cant believe the difference. its amazing! looks awesome! love the new look! looks amazing, you did such a great job! love the last too "keeping it real too" gotta love animals, they have their own agenda! It's the perfect spa bathroom! Love the colors and the feeling in the room. The shower is my favorite part also. It looks amazing! Great job. Wow, that is seriously amazing!! Love love the cabinets! You guys did a really nice job! Looks absolutely perfect! I love how the colors make it look like a spa! Wow Julie I LOVE the transformation!!! It looks gorgeous!! Great job!! It's gorgeous! You've done it again. Someday you have to re-do my entire house. I love everything about your bathroom! I looks fantastic! 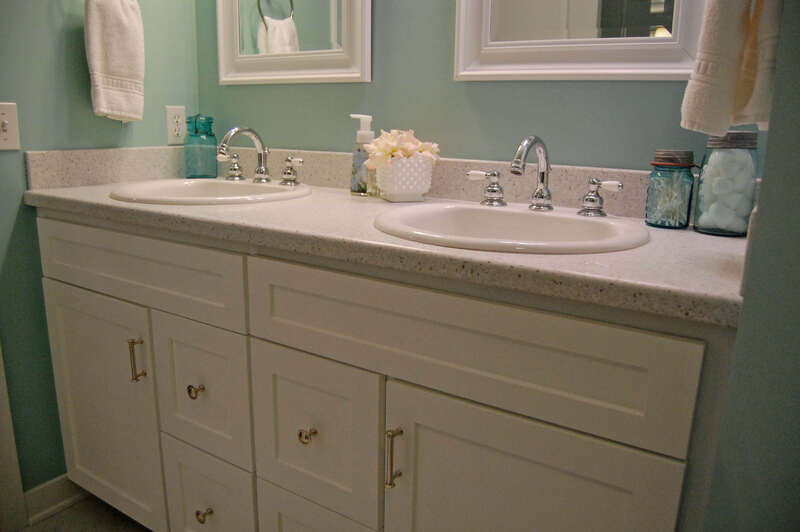 Your bathroom is seriously incredible! I love all the blue touch — gorg! This transformation is gorgeous! You guys did a fabulous job!